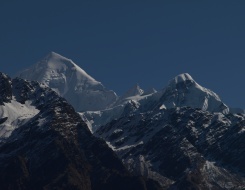 The Panchchuli peaks lie in the Eastern Kumaon Himalaya and form the watershed between the Gori Ganga and Darma Valleys. Dharma Valley is 134 kms from Pithoragarh and 35 kilometers from Dharchula. From Sobla to Pancha chuli Glacier is a 40-kilometer trek. The route to the glacier is flourished with an impressive combination of enthralling scenery, snowcapped mountains, gushing streams, Alpine meadows and a rich variety of flora & fauna. And from the glacier the trekkers would be able to find the Pancha chuli peaks in their towering glory. The eastern and the southern Balati glaciers guard the western approaches by nestling closely in the lap of the snow capped peaks of Panch Chulli. From Sobla to Pancha Chuli Glacier is a 40-kilometer trek which then passes through the tribal villages of Dar, Bungling, Sela, Nagling, Baaling and Duktu / Dantu village in the Darma Valley before reaching finally at Punch Chulli Glacier. The final road head is 42 kms from Dharchula (dist. Pithoragarh). Dar to Panchachuli Glacier is a pleasant walk and the trail goes through the tribal Villages of Bongling, Sela, Nagling, Baaling and Duktu along the river Dhauliganga and thick Forests of deodar and Bhojpatra and conifer. Trekking around Panch Chuli Base Camp is really an enthralling experience to enjoy all around the year its pleasant atmosphere. Early in the morning drive to Almora via Kathgodam. Lunch enroute. Arrival at Almora by evening. On arrival check in to the hotel. Dinner and overnight stay at the hotel. After breakfast drive to Dharchula via Munsyari. On arrival check in to the hotel. Dinner and overnight stay in the hotel. In the morning we will take a short but exciting drive to Sobla via Tawaghat and from here trek up to Dhar. Sobla is the entry point to the Darma Valley and is the starting point of our trek. On arrival at Dhar village set out a camp for dinner and overnight stay. This is an easy day for trek. Today we will trek upwards and downwards. Dinner and overnight in tents. In the morning after breakfast we will trek up to Baaling. The trek is full of adventures. On arrival set out camp for dinner and overnight stay. In the morning we will trek up to Duktu and Dantu. These are two adjacent villages which are the last centers of human habitation in this part of Darma valley. The view of the Panch Chuli peaks from here is just magnificent. You can find a huge meadow in the outskirts of Duktu. One can see the magnificent view of Panch Chuli glacier with the backdrop of the Panch Chuli peaks. Dinner and overnight stay in tents. In the morning we will trek up to Pancha Chuli glacier. The day is memorable to explore the Panch Chuli glacier from our base camp at Duktu. The glacier projects outwards from the East face of Panch Chuli and a 4 kms. The place itself provides an incredible scenery of a sprawling meadow bordered by tall oak and birch trees with the Panch Chuli (6904 mts./22652 ft.) looming in the background. After exploring the area trek back to base camp at Duktu. Dinner and overnight stay at camp. After breakfast trek back to Nagling. From Duktu to Nagling is a gradual descent and the days walk takes around 5 hours. In the morning we will trek down to Bungling. The trek is easy to downwards. Dinner and overnight stay in tents. This is our last day of trekking. We will trek down 5 kms to reach Sobla and from here drive to Dharchula. Dinner and overnight stay in hotel. In the morning drive to Almora via Munsyari. Dinner and overnight stay in hotel. After an early breakfast drive to Delhi. On arrival at Delhi transfer to airport to catch your onwards flight.